Client’s cool coffee area with open shelves displaying some of her LE CREUSET collection. Much more appealing than just another cabinet with an appliance. So you are embarking on a kitchen remodel or building a new house. It is time for you to pick your appliances. Appliances are the work horses of your kitchen - they also will eat up a large portion of your budget depending on the grade of appliances you are choosing. Today there are never ending appliances that you can add onto your list. Generally the appliances on this list require a built-in cabinet installation. These sound nice in your Martha Stewart imagery of making large meals and keeping meals warm for your loved one to arrive home late. Reality warming drawers become an expensive storage drawer. You probably do not need it. Also, if they are installed low to the ground and you have pets, when you open them up you could easily have hair float into the food or fido or kit kat will be in for a quick snack. Steam ovens promise a lot - I feel like there is nothing you can do in a steam oven that you are not able to achieve through conventional range top steam pots or a standard oven using water and heat. These are not cheap and they require a built in cabinet to hold them. You loose storage space and you potentially have a cabinet with a hole in it with a non working appliance when it eats the dust. I had a client insisting on putting in a Wolf cappuccino machine that required a built in cabinet and a water line going to it. My opinion on this type of appliance is always the same - you are spending a lot of money on an appliance that could go bad within 5 years and you are stuck with this expensive cabinet and a non-working appliance that may no longer exist. My style is generally to just give an opinion, but ultimately move forward with client wishes. It is not my space and my end goal is always to achieve a space that works for my client. During the design process we were getting close to the end and I must have repeated myself again somehow and a light bulb went off in her head and she totally agreed with me. We instead created a counter space for an amazing counter machine she bought - a drawer beneath set up to store cups. The cool expensive built-in gadget appliance was not necessary and would loose it s coolness pretty fast and could just become an annoyance. I was happy - because in the end she was happy. Totally know that most people will not agree with this. The microwave really is not a necessity. Common things you hear about getting rid of the microwave: “How will I boil water?”. “How will I heat up food?”, “How will I make popcorn?”….. The perpetuation of the microwave in people’s kitchens has creating generations of people who do not know how to cook basic things. Without the microwave, you are forced to actually cook. You can boil water in a kettle. You can heat up food in an oven or on the range top. You can make non chemical laden popcorn using a pan, oil and popcorn. I have not had a microwave in 12 years - do not miss it and would never take up expensive cabinet space for a built-in microwave. The nice drawer versions start in the $1000 range. The only proper place for a microwave is someplace you do not see it - just my thoughts from a design perspective. I really believe you can live without one. I think these are actually useful. However, if you do not have the space for a trash compactor and built-in trash cabinet also for recycling - you may want to just go with a 2 barrel trash cabinet. People love vanities because the hold a ton of stuff both inside the vanity and the countertops that tend to just get crowded with crap. Totally guilty here. Our master bath vanity’s drawers are filled and the sink bases are filled with stuff too. The top also has too much stuff on the top. The thing about vanities is that they hold a lot of stuff, but they also cost more. You have to buy the cabinetry, the top and the sink(s). Which can quickly add up. 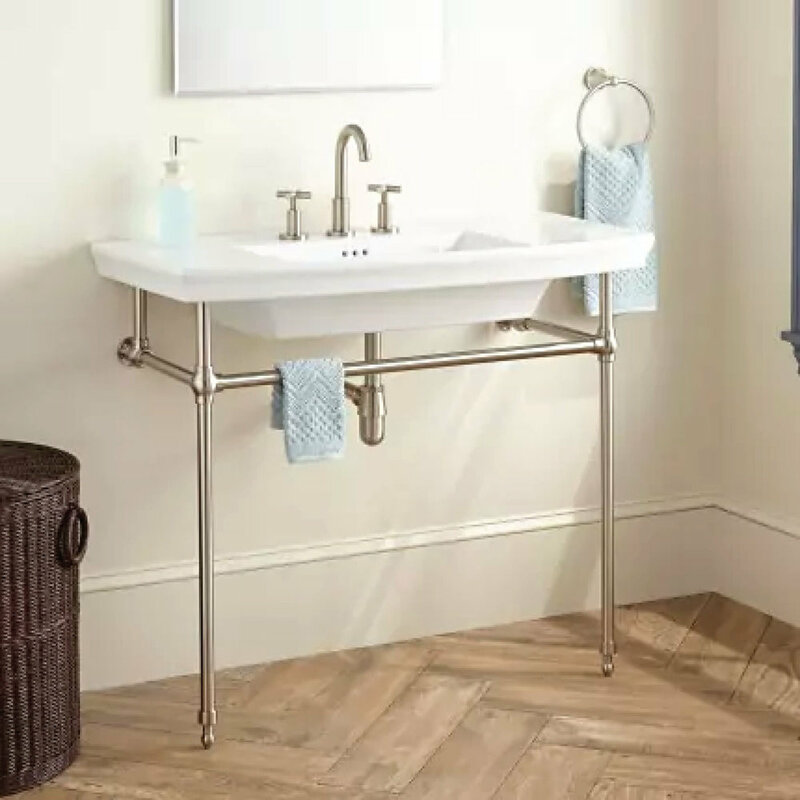 Baths that are for guest rooms, basement baths, and powder rooms are good rooms that may benefit from a pedestal type sink instead of a vanity. Also, homes that are primary second use or short term rental homes pedestals could be even used more. There are a lot of good options out there that look great and offer a clean uncluttered look. Vanities seem to invite clutter. SIGNATURE HARDWARE offers some classic pedestal sinks that would work well in any type of bathroom style. I think it is best to have bathrooms that lean towards classic/transitional design that will stand the test of time. Bathrooms are really costly rooms - if the core elements are classic, then walls can morph over time, hardware, mirrors and light fixtures can off updates without tearing out the really expensive parts. I contemplate the future of these buildings. Will it transform into something else 10 years from now or will it be stripped apart and crumbled to the ground. When a real estate property charges the types of rents for these retail spaces – part of that promise is that the property itself will attract large numbers of people for exposure. I am back today at the mall because after I had the screen replaced yesterday I was not able to plug it in to charge. Already went to the Apple store and silly me – a piece of lint had gotten into the port. Simple fix and off I went. I am sitting in the food court working until I have to pick up my daughter from K at 12:30. It is 11:30 and people are arriving to get lunch – it does have one of the few Chick-fil-A’s in the Boston area – which is busiest of them all the food court options. Maybe Chick-fil-A and the Apple Store can save the mall. Some of the new shopping centers that are being built where all the stores are open to the street mixed with a grocery store, restaurants and entertainment are on the right track. I think they are failing also. Developers should be looking from the past to build the future. Town centers that mix life with retail are the future – future development should cultivate community not simply isolated retail. We no longer need retail stores – except the Apple Store of course – we will always need development that fosters community and more so than ever as technology has an isolating affect. The mall distracted people away from town centers since the 80s – the revival of the town center and new development that mimics town centers of old and of Europe will be the future. It would be even better if the car can be eliminated from it – it becomes a place where people walk and mingle in the open air – a place that draws people in and rejuvenates them. Great design feeds the soul and the human senses. As I sat in my car at the gym this morning trying to find every excuse to not go in, the similar inner voice struggle that has been winning seemingly forever was trying to win once again. Let’s face it, I am sitting in the parking lot – the only effort at this point is to open the door, grab my gear and walk into the facility. My only goal was to lift Chest and swim 1000 meters – it is called a basic workout that my overweight and out of shape body can do. Both things that I enjoy doing also (once I actually show up). I sat there for at least 15 minutes in a fog on my phone doing nothing. I am not going to get any other earth shattering thing done in the next 2 hours until I have to pick up my daughter from preschool. I have to get a shower anyway. I finally just make myself move, grab my stuff and walk in. As I was coming down the stairs into the locker room, in front of me is a gentleman I presume to have ALS or similar condition in his wheelchair now with his wife, a care assistant and a trainer. I have seen him in the past, but since I have not bothered showing up myself for months basically (random showings – nothing consistent) his disease has progressed to this point – last I saw him, he was still able to walk. It hit me like a sledge hammer over my head. How much effort did it take for him and his wife and care giver to not only get out of bed today, but go to the gym to do whatever his failing body can do. As I am writing this, it is still shaking me to the core. My overweight out of shape self has no excuses to continue to fail my body. I know what it is like to be strong, to be thin, to be able to run 10 miles… I know that by failing to make choices that bring about a strong, thin and fit body – I have let the other voices win and my body continues to just morph into an undirected self – eventually health issues may arise because of it. The mind game is real, but nothing I face in my life is greater than the effort this gentleman I witnessed today must make to just get up everyday. He and his wife were such an inspiration to me today. No I cannot run ten miles right now – I am saddened by what my body has become. It is my choice to make changes and love my body and do what is required to be a new strong, thin and fit. I know how to workout – I know how to swim strokes – I know how to ride a bike – I know how to run – I know how to lift free weights… It is just that my body has to be rebuilt. It has memory and lifting and swimming are my go to exercises. I cannot run right now, but I am walking… I must win the mental game in order to win the physical one. The voices of procrastination and distraction have to lose and FOCUS has to win. I have the 50-year-old birthday coming up in a year and half. I ventured to look at what the Boston Marathon qualifying times are for my up and coming age. I cannot run a mile right now, but in my twenties I did run a couple marathons. In my twenties, the Boston Marathon qualifying times seemed daunting and unachievable for me. I looked them up to see qualifying times for now 45-49 (3:55) and 50-54 (4:00). I believe my best twenty something time was 4:15 at the Chicago Marathon circa early 90s. I have been swishing around in my mind a goal to qualify to run the Boston and then run it as a 50-year-old milestone. The times seem to be approachable now – if I spend the next 3 months lifting, swimming and walking by fall I should be able to run again. Then as I approach 49 in December, running up to 5-6 miles should not be an earth shattering effort… I have planned so much over the years to make a U-Turn on my conditioning – I am discouraged at this point to even plan, because of failing myself. The reality is – there is no hope of change unless I do set goals and plan – it is just about being true to myself and showing up. This gentleman today has inspired me so much. It is difficult to put into words – he demonstrated perseverance in the face of adversity beyond my comprehension. So you decided that you are going to redo your bathroom(s), you really want the double bowl sink feature. 2 sinks are great right? More is always better? Everyone wants 2 sinks! ..... I really have been changing my mind on this herd mentality of the double bowl sink vanity. I hate my double bowl sinks in my master bath and my hall bath. I have determined that very little time is actually used at the sink itself. Really how long does it take to brush your teeth or wash your face? I estimate brushing your teeth takes 30-60 seconds and washing your face 30-60 seconds - maybe more, but really not much more if you are focused. Hand washing - once again not a long task... Men shaving would be a longer task - need to determine how long. On the other hand, I spend a lot of time in the bathroom getting ready especially with a 2 year old. There is not a lot of counter space on the top and what is there is a cluttered nightmare. I do have more on the top now because of the need to try to keep stuff away from the 2 year old - which will change. I WANT DRAWERS and MORE DRAWERS. I want the clutter to go away. If I was redoing my baths, I would not do double sinks. Just because everyone does it, does not mean that it is the best solution. The one caveat of this is if the bath is large enough for 2 separate sink vanity areas or if you have more than 72" to work with. SAVE MONEY on PLUMBING FIXTURES or UPGRADE THEM: You can save money on plumbing labor and plumbing fixtures by doing just one sink. You could take the money you are saving by upgrading the fixtures themselves. A typical sink bowl for a vanity costs between $75-$300 (you can spend less or more). Nice quality faucets start in the $200 range and can easily be $500 or more depending on quality and finishes. INCREASE STORAGE AND COUNTER SPACE: I designed 3 different examples of 5' vanities with a single sink. The theme - drawer storage is king. In addition you will gain 21" of counter space - awe the thought of more flat counter space to spread out the goodies and then have a place for them to go! CENTERED SINGLE SINK 5' Vanity with 8 DRAWERS: This would enable 2 people or more to really organize toiletries, makeup, hair tools, etc. This is another take on the single bowl vanity. the drawers are deeper on the sides, but i added the drawer below the sink - this requires plumbing to come out of the wall above the higher vanity floor - requires plumbing rough planning. Sink off center allows for around 40" of straight counter top. The large drawers could have dividers in them to organize hair tools, toiletries, etc. I think this would be great for a kids bath too - you could use the countertop as a diaper changing station . The single bowl vanity may not be the perfect solution for everyone, but it may make you think about it before automatically designing a bath around one. In smaller to medium sized homes storage is a premium and simply doing a 5' vanity with one sink can add a lot of storage. Getting the fruit out of a pomegranate. Not as hard as it seems. Water, water, water.... Your best friend and consuming large quantities of it is very good for you. I used to be a bottled water enthusiast by the case Fiji and Evian being my favorites. Just become not the most economically way to consume large amounts of water. It is my daily goal to consume an ounce of water for every pound of my weight. Needless to say this is generally a goal. When I am super hydrated my energy levels are high and my body just functions better. Frequent trips to the bathroom are the only downside. Anyway, a recent trip to Hawaii the hotel would put out water in the lobby every afternoon and I came to love the lime and some type of flower version... The water went down really easy and always craved more. I have taken to doing the same thing at home sans the flowers. Easy way to enjoy refreshing water throughout your day. Also, a good way to provide water to guests during the holiday dinners and parties. Skip buying the small bottled waters. Are you looking to buy carafes at a good price? I love my WECK carafes - they come in a bunch of sizes and you can get plastic covers if you like to keep teas or other beverages in them. When working with other people to create a new kitchen, finishes within a home, new spaces, etc... my goal is to try to read people to bring alive their vision for the space they are doing - sometimes they do not even know what they want. What choices I personally may make for a space, may not coincide with a clients desires and vision. The KEY is reading people indirectly. Listening to what people say, observing their life style, and getting general information about what they are drawn to in their home or other design aspects. There are a few choices that may be the best. There are many choices that are right. There are some choices that are not ideal, but if you love it go for it. There are a few choices that are just wrong. In my mind, it is my job to guide the decision making choices so that they stay with the over arching vision of the project. However, the client needs to feel like they were a part of the process. It is important to be mindful of financial realities. If you are working on a project of your own, have a BIG vision for it. Then use the BIG vision to guide the other choices. If you know you like modern lines, natural wood and minimalist areas - then you are not going to pick out a 5 piece crown for your living room. Houzz and Pinterest have created default picture galleries for you to get an idea of what you like to assist you in creating your BIG vision for your project. If you feel like you need, help then find a friend, design professional or hire a contractor that has design talent that can guide you. Get you BIG vision and know it - it will make it all go easier.